Nao already published a short post on the Yue Yuen strike. A few days ago another strike hit Yue Yuen, this time in the city of Zhuhai. The gongchao-article puts the events at Yue Yuen into the context of the rising number and the changing quality of strikes in recent years. Direct action is an important mode of political participation in China. The number of migrant worker strikes in China has risen in the past few years. China is the second largest economic power in the world and a central node of global production chains, so its strikes have an effect on the social and political texture of the country and beyond. How have strikes in China developed in the past two decades, and what characterizes them today? In their book, published in China in 2012 and based on interviews with striking workers in the Pearl River Delta (PRD), Hao Ren, et al. describe the development of worker militancy since the 1990s. After the crushing of the Tian'anmen uprising in 1989 and the temporary suspension of market reforms thereafter, the Chinese Communist Party (CCP) regime accelerated the restructuring of the Chinese economy again after 1992. Foreign investments increased, and millions of migrant workers moved to the PRD and other industrial centers to work in the new factories. The conditions were characterized by a high rate of accidents, low wages, frequent wage theft, long overtime and high work intensity. Bullying and abuse by managers was widespread, but migrant workers fought back, with violence or hidden forms of resistance. In 1993-1994 a first strike wave rolled over foreign factories, like the Japanese company Canon in Zhuhai. The state's migration regime (hukou), that divides the population into rural and urban dwellers, was asserted through controls, deportations and police violence against "illegals". In 1995, the Chinese Labor Law was implemented, and at that time, the official labor bureau regularly intervened in labor conflicts. According to Chris Chan, the state wanted to "absorb workers' radical actions into administration-managed legal channels." China's entry into the WTO in 2001 led to a further increase in foreign investment. Despite the loosening of the internal migration regime, new export-oriented industrial centers like the PRD experienced a shortage of labor power, since many (potential) migrants refused to accept the lousy, low-paying factory jobs. Between 2003 and 2007, the number of wildcat strikes in China increased sharply, and the PRD saw more strike waves, especially in foreign companies. Jay Chen sees this as a "turning point" in the development of mass protests in China. Since then, the conditions in the factories have gradually improved somewhat, the labor intensity has decreased slightly, overtime has declined, as has the usage of violence against workers. Nominal wages have risen substantially, as the regular increases in state minimum wage standards show. In the special economic zone of Shenzhen, for instance, it increased from 574 RMB per month in 2001 to 1,000 Yuan in 2008. However, prices increased sharply as well. Hao Ren, et al. describe how strikes started with leaflets and mobile phones and how protests in other companies were taken up and imitated. According to Chris Chan, throughout the 2000s, migrant workers also learned to take the struggle beyond the company walls and onto the streets. They called the media, blocked highways and circulated reports on the internet. Apart from production workers, in many strike cases low-level managers and sometimes even office staff took part in the strikes. The authorities reacted repeatedly with the usage of police violence or even the arrest of strike activists. The global crisis in 2008-2009 led to a wave of dismissals in China and, in particular, in the PRD. The CCP regime postponed the scheduled increase of minimum wages and modernized labor laws and mediation mechanisms in order to strengthen the state machinery for the channeling of struggles. Capital used the crisis to improve its coordination and organization, and it tried to pass on the costs of the crisis to workers – and to the state. In cases of company bankruptcy, the authorities repeatedly stepped in and paid for wage arrears. Workers reacted with defensive struggles against relocation, dismissals, closures, wage theft, and so on. After the recovery of the economy in 2009-2010 and the return of the labor shortage, the tide changed again and the position of the workers strengthened. In 2010, a new strike wave occurred. The starting point was the strike of Honda workers in Foshan who won a 35 percent wage increase. According to Hao Ren, et al., subsequently workers were more determined, demonstrating solidarity and persistence. Offensive strikes won a general wage increase, and in some places, workers demanded that the unions be put under worker control. The strikes continued unabated in the years 2011 to 2013, writes the China Labour Bulletin (CLB) in a recent report, and factory wages increased by a further 50 percent between 2010 and 2013. Many companies tried to compensate for the higher wages by cutting overtime hours and bonuses, introducing working time accounts and higher wage reductions for food and accommodation. In addition, capital increased the usage of temporary agency work and limited work contracts to be able to react to fluctuations in production – and to divide the work forces. In 2011, 60 million were employed through temporary work agencies in China. Capitalists will always be capitalists. 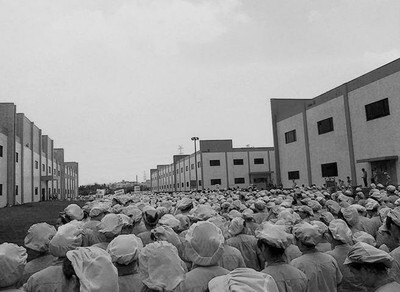 Up to 50,000 workers from all six Yue Yuen (裕元) shoe factories in Dongguan, South China, went on strike in April 2014, the biggest migrant worker strike affecting one foreign-invested company so far. Yue Yuen, run by the Taiwan-based Pou Chen Group, is one of the world's biggest contract manufacturers for shoes, making over 300 million pairs in 2013 – 20 percent of global production of sports and casual-wear shoes. More than 400,000 employees (2012) produce shoes for more than thirty brands such as Nike, Adidas and Reebok in factories in China, Indonesia, and Vietnam. In Dongguan, Yue Yuen employs 60,000 workers in six factories, producing mostly for Adidas and Nike. With overtime and bonuses, employees at Yue Yuen (including managerial staff) earn an average monthly wage of around 3,000 yuan (490 USD). However, assembly line workers' wages start at the local minimum wage of 1,310 yuan (210 USD), reaching 2,200 to 2,800 yuan (350 to 400 USD) once overtime as well as individual, group, seniority, and attendance bonus payments are included. When orders are low and production is slow, wages can be even lower. About 70 percent of production workers in the shoe plants are women. In the sole-making plants they make up 50 percent, whereas in the molding factory the majority are men. Over 70 percent of employees have been working for Yue Yuen for more than five years, with between 10 and 15 percent having worked there for more than ten years. Many of these experienced workers joined Yue Yuen at the age of 18 or 19 through relatives or other people from their hometowns. Some now have children who work in the factory, too. The experienced workers know each other well and constituted the backbone of the recent struggle. In the past few years, workers at Yue Yuen had already been involved in protests and small-scale strikes. In 2008, for instance, hundreds of workers at a molding plant were dissatisfied with their labor contracts and refused to sign them. The employer called the police, who sealed the factory gates so that nobody could clock in for work. Workers then gathered at the gate of the Dongguan government building. In past struggles, even some of the Chinese shop floor managers mobilized workers if they did not like decisions made by the Taiwanese top management. The recent strike broke out after workers found out that the company had not been paying the full social insurance contributions required for retired workers to get full pensions. Instead of paying the social insurance contributions according to the full monthly wage, the company had just paid it according to the local monthly minimum wage. The pension fund is especially important for workers, because – provided the full contributions are paid for many years – they are entitled to receive a pension or transfer of cash in their accumulated pension fund if they change companies or provinces. The Chinese state introduced new social welfare systems based on contributions by both employees and employers after the dissolution of the people's communes in the countryside in the early 1980s and the restructuring and partial destruction of the old welfare system in the cities ("iron rice bowl") in the 1990s. However, not everyone is covered and the system is underfunded, suffers from corruption and non-compliance by employers, and does not function well. Most small companies simply do not pay their contributions, bigger companies like Yue Yuen pay only according to the legal minimum wage, not the actual wage. Both argue that otherwise their tight profit margins would be eaten up and they would loose their labor cost advantages. The government turns a blind eye to companies failing to pay or underpaying their social insurance contributions. "The factory has been tricking us for 10 years," said a female Yue Yuan worker. "The district government, labor bureau, social security bureau and the company were all tricking us together." Another source of accumulated discontent behind the outbreak of the strike was the low wages and the fact that wages had not been raised for long. Each time Dongguan's minimum wage was increased, Yue Yuen reduced workers' bonus payments. Yue Yuen was once considered a relatively good factory, but that is no longer the case. There is a high turnover rate and, as one worker put it when commenting on the strike: "Workers just took this opportunity to vent their anger!" The confrontation began with hundreds of workers blocking a bridge in Dongguan on April 5, 2014. When the company failed to respond, on April 14 workers in several plants went on strike, and more than 10,000 protested in the streets. Hundreds of riot cops attacked, beat up workers and arrested some who had held up banners. Later the police stayed in the factory area, and the arrests continued throughout the strike. This included at least two activists from local labor NGOs. The workers demanded new work contracts, improved working conditions, and full make-up payments to the insurance fund. On April 15, the strike spread to all six Yue Yuen factories in Dongguan, and involved up to 50,000 workers, who swiped their cards at the beginning of their shift but did not work. On April 16, the company asked for negotiations. Workers volunteered as representatives, but when the company refused to make concessions the negotiations broke down and some of the worker representatives were arrested – allegedly with the help of state union ACFTU officials. On April 17, the Yue Yuen management promised to pay the future social insurance contributions in full starting on May 1, on the condition that workers also pay their part of the contributions. Workers stated they would not return to work before the company agreed to pay make-up contributions at once – in cash, because they did not trust neither the company nor the government on this issue. On April 18, the wives and children of arrested worker representatives demonstrated at the factories and in front of the district administration, demanding their release. On the same day, 2.000 workers from another Yue Yuen complex in Jiangxi province, producing mainly Adidas shoes, joined the strike. On April 21, Yue Yuen promised to pay a monthly living allowance of 230 yuan starting on May 1. "Workers rejected this offer, expressing insult at the small concession and distrust of the company to carry through as promised. In response to pink union leaflets announcing the 230 yuan allowance, workers scoffed that they had already lost years of unpaid pension money and even if they received full pensions plus a 230 yuan allowance in the future, it would not make up for the money they had lost. Many workers had already worked at the factory for over ten years and were approaching retirement. They would not be working there long enough to accumulate much in future pensions and would not be able to enjoy the allowance for many years. Other workers suspected that after they returned to work the company would simply find a way to fire them, and they would have no chance to enjoy the future gains." In addition, there is a problem with the social insurance contributions: It was not just Yue Yuen which has not paid the full contributions but the workers did not do it either. "Now, most of the workers at Yue Yuen don't want to pay the social insurance in arrears, because they have to pay their employee contributions out of their own pockets and they can't afford it. Long-term employees need to take out social insurance worth tens of thousands of yuan! Where can they get that kind of money?" Therefore, the workers demanded that Yue Yuen pays both, the portion of arrears the company owes and the portion of the workers, too. On April 22, demonstrations in support of the Yue-Yuen-workers took place in Hong Kong, Taiwan, Australia, and the USA, while in Dongguan the ACFTU intervened again to attempt to stop the strike. "I think they have coordinated this – the [union] federation, the cops and the employer. They stuck a combined blow against the workers." At this point, police closed the factory gates so workers could not enter or exit and would be unable to swipe their factory cards at the beginning of shifts before returning to the dormitories. Later, the management removed the shift clocks altogether. On April 24 and 25, the local authorities brought in even more riot police and stationed them around and inside the factories, arresting workers who did not resume work – all to increase the pressure on the workers to accept a deal. Even plain clothes cops went inside and arrested workers who refused to go back to work. "Yue Yuen Shoe Factory became Yue Yuen Prison! ", said one worker. Another commented: "We have no choice but to go back to work. What can you do if a man with shield, baton and helmet is standing next to you?" By April 28, about two thirds of the workers had returned to work, while workers in one plant continued the strike. The strike was self-organized, and workers used their smart-phones and internet chat rooms to mobilize for the protests. Shop-floor managers and in some cases experienced workers played a decisive role, but as in other strikes, they did not do it openly to avoid retaliation by the management. The organizational depth was not the same in every plant and department, though, with workers in some being prepared and relatively well organized, while in others they merely joined the strike without any internal organizational coherence. There are also rumors that Yue Yuen bribed shop-floor managers who had either stayed passive or played a role in organizing the strike but, eventually, put a lot of pressure on workers and used kinship networks and violence to force them to return to work. Line leaders were not paid anything for this but, according to a worker, could not take the pressure anymore and forced the workers to resume work. "I have worked here for 15 years, and I am not going without a proper response," said a 46-year-old female worker from Hunan. "Many of my co-workers are women: They thought we would be easy to pick on, we are here to prove them wrong." The striking Yue-Yuen-workers stayed firm for about two weeks and rejected settlement offers by the company that would have only partially solved the problems. They wanted to see cash in their hands before they give up or get sacked, and that explains their determination, since it is rare in China that strikes continue for so long. "The strike has failed, we didn't get the result we wanted." The main reasons for the failure are the government repression and the fact that some workers either stopped the struggle after the 230-yuan-concession or continued but with a pessimistic outlook since they did not expect a better outcome anymore and gave up in the end. The state intervened with force, sending riot cops and threatening the workers, but, despite the size of the strike and the fact that the workers took the streets, it did not repress the struggle immediately or altogether but waited some time. However, the late repression was successful. "Although we returned to work, we still harbor resentment. We all feel aggrieved today. Outwardly, the strike has been resolved but the underlying problems are still there. All in all, we are frustrated. We feel especially dissatisfied because of the government’s suppression of workers. All of us feel very angry at being forced to work now." This anger led to some attacks on shop-floor managers. Yue Yuen announced that the strike had cost the company 27 million USD in direct costs, lost profits and additional airfreight costs and that the settlement will raise employee costs by 31 million USD this year. Yue Yuen has been shifting production out of Dongguan to inland provinces as well as Vietnam and Indonesia for years, despite concerns about lack of infrastructure and lower productivity. The increasing demands and militancy of workers and the resulting higher wages encourage capital to move. Nike and Adidas began shifting production to inland areas or, for instance, to Vietnam where wages are even lower. Even during the strike, Adidas reacted fast and moved orders: "In order to minimize the impact [of the strike] on our operations, we are currently relocating some of the future orders originally allocated to Yue Yuen Dongguan to other suppliers," an Adidas spokeswoman said by e-mail. The German sportswear maker "has a highly flexible supply chain in place." During the strike, Adidas also moved equipment out of Yue Yuen plants and sent it to other shoe factories in Guangdong Province. In the early stages of the strike, workers even hoped the government could help mediate in the dispute but they saw the government's true colors when the union's intervention intensified the suppression. They are the hatchet men and running dogs of the employer. The fire was put out but the embers remain and it will ignite again. And in the next strike we will definitely be better organized and combat-ready! In terms of number of participants within a single company, the Yue Yuen strike was the biggest strike of migrant workers in China since the beginning of the boom in the 1990s. Usually, strikes are carried out by tens, hundreds, or a few thousand workers. This time up to 50,000 were involved. The strike spread to one other province, which is a promising sign, but no further. It lasted approximately two weeks, a lot longer than the usual few hours or days. However, it did not escalate beyond the limits we have seen so far: it included work stoppages, demonstrations, some clashes with police, but it did not lead to an overall uprising, and it ended with some concessions but no breakthrough for workers. The aims of protesting workers have changed and multiplied in the recent past. Their struggle is not just about wage increases or improved working conditions but job security (in the face of closures and relocation) and social insurance. The Yue Yuen strike also reflects a demographic change in the composition of workers and their migration patterns. The large wave of migration to industrial centers like Dongguan started in the 1990s, and although many migrants returned to their inland villages or towns, millions stayed in the cities. Some of them are now retiring (in China, generally at 60 years for men and 50 for women) and have no chance to go back to the village and farm, so they demand pensions which they are also entitled to get (as long as their employers have paid the social insurance contributions). In an increasingly volatile economic environment and amidst fears of the end of the boom, the labor shortage in China's industrial heartlands has continued, shifting the balance of power between capital and workers. Workers' ability to organize and struggle has increased in past years through the usage of social media. New hardware in the form of smart phones brought internet into the pockets of millions of workers, while new software such as the Chinese Twitter-like weibo and WeChat have enabled them to send reports, photos, and films. Both are used for organizing as well as public exposure of working conditions in order to put pressure on capital and the state. Meanwhile, the dominance of the state media has been undermined. An increasing number of strikes spreads and triggers more protests in other factories (sometimes of the same company). And the Yue Yuen strike is part of a series of worker protests that started in March and included Wal-Mart stores and several factories including at Samsung, Nokia, and IBM as well as teachers, street-cleaners, taxi and bus drivers. Besides strikes, violent outbreaks of public anger continue in China. In one case, some urban management officials (chengguan) were beaten by a crowd in Cangnan, Zhejiang province, after they had harassed a street vendor and killed a man who took photographs of the incident. Still, it is not yet clear how important or exemplary the Yue Yuen strike and the strike wave in the spring of 2014 will be for the future development of class relations – for instance, compared to the strike wave in state owned enterprises (SOE) in the early 2000s or the strike wave in summer 2010, which both had long-term implications: the government changed its rhetoric and introduced social policies in the early 2000s, and the 2010 strike wave established the migrant working class as a recognized actor in Chinese society and politics. In the past few years, the authorities have kept out of the protests and strikes as long as they were small, but when conflicts expanded or affected larger companies, they usually got involved. According to CLB, the police intervened in 20 percent of the strikes cases it investigated, mostly when workers "take to the streets" or "disrupt social order". In mid-2012 and in the second half of 2013, the number of police interventions and arrests of strike activists increased drastically, and in 2012 the authorities took more action against NGOs supporting workers. However, the reaction of the Chinese central state to the Yue-Yuen- and other recent strikes demonstrated again its dilemma: on one hand, it is interested in raising wages, a necessary condition for enlarging China's internal market and lessening the dependency on exports and the impact of the lower foreign demand. On the other hand, it fears the escalation of the class conflict that could have not just economic but political implications for the rule of the CCP and capital in general. In recent struggles, this has led to situations where strike activity was allowed within certain limits and for a certain time-span but was still repressed if it exceeded a certain time or lead to clashes on the street. This partly reflects the different interest of the central state, which plays the role of a "collective capitalist" that tries to ensure social stability and the continuation of the system of capital accumulation, and the local state, which is directly connected to the exploitation process and profit accumulation through leases, ownership, etc. Surprisingly, Hao Ren, et al. conclude in their book about strikes in the PRD that many work-stoppages, demonstrations and street blockades have still been "spontaneous" in the past few years. Jay Chen, on the contrary, underlines that "individual resistance and collective protests were in many cases not spontaneous, intuitive actions but carefully planned and organized. The protest strategies were more and more optimized, too." The strike cases in the book Hao Ren, et al. published also show the preparation, solidarity, circulation, and learning processes during the struggles. They give evidence of the daily contradictions workers face on the assembly lines, in the dormitories and canteens and illustrate how workers’ cooperation is not only a basis for production but also for rebellious organizing. The importance of strikes and strike waves lies in the fact that they can give this rebellious organizing a push. Striking workers have the chance to recognize that their problems are the problems of many other workers as well. The experience of struggle can take them out of their isolation, competition, and social misery and offer them ways to take collective action. This process could be seen in China in the past few years. Strike experiences circulate, strike tactics are evaluated, collective strategies are tested, activists emerge and send out signals for solidarity actions. The realization that work stoppages can force concessions and enable workers to escape the rat race for hours or days spreads. Struggles are usually about economic demands, but also the unfulfilled expectations, the daily drudgery, the injustice and degradation. Strikes and other forms of resistance have been more widely accepted, not just among migrant workers, since the strike wave in 2010. Some even start working in factories just to learn from workers and support their struggles. CLB writes that workers in China " increasingly realize that (…) they can certainly go it alone and get by without the trade union" but "they will have a much greater chance of creating a powerful, unified and sustainable presence in the workplace if they can reclaim the union for themselves." But is the reform and takeover of the unions a precondition for a lasting improvement of the workers' conditions? CLB ignores the role unions have played in the separation of workers, the weakening of struggles, and even the worsening of exploitation, for instance, in South Africa, Brazil, or India, and how unions offer their service for the integration and pacification of struggles. Wildcat strikes, more than anything, can be signs of the self-activity of a working class and help the participants to overcome divisions, get rid of the paternalization through union hierarchies and establish themselves as a movement beyond rituals of social partnership. Practically, the assimilation of struggles can be prevented if protesters follow the insights formulated by Hao Ren, et al. : "Strikes could be organized more easily when workers had made secret arrangements and done actions beforehand – most of all as hidden slow downs," and "it is a big advantage if there are cadres who can lead the strike from the background. That also applies when the strike is organized and a core of workers supports it. That way it is possible to prevent the repression of the strike by capitalist and to continue the struggle in an organized fashion." Especially in a region with such capital concentration as in the PRD it is important to form worker groups which prevent repression but also refuse to take part in constructing a capitalism-apt workers movement – and focus on the development of their ability to struggle, their disruptive potential, and their power to transform the social order, in every strike. 3 CHAN, Chris King-chi: "Contesting Class Organization: Migrant Workers’ Strikes in China’s Pearl River Delta, 1978-2010," International Labor and Working-Class History, Nr. 83 (Frühjahr 2013): 112–36. 4 CHEN, Chih-Jou Jay: "Die Zunahme von Arbeitskonflikten in China: Ein Vergleich von ArbeiterInnenprotesten in verschiedenen Sektoren," in: Eggers, Georg, et al., Arbeitskämpfe in China. Berichte von der Werkbank der Welt (Vienna, 2013), 78–105. 8 Dongguan has become an industrial city of eight million in the past two decades. Sandwiched between Shenzhen and Guangzhou it is the center of the export-led economic structure of contract manufacturing, i.e. the production of components or the assembly of prefabricated elements into products for major international brands. Most of the workers are migrants from rural areas and other provinces. 25 Notes after a visit in Dongguan and discussions with workers, April 2014. 29 http://www.clb.org.hk/en/content/defeat-will-only-make-us-stronger-workers-look-back-yue-yuen-shoe-factory-strike. The interviewee also stated that workers had talked to policemen who were, actually, sympathizing with the workers but said they had to obey orders. 41 In that respect, the commentary (at http://wire.novaramedia.com/2014/04/5-reasons-the-strike-in-china-is-terrifying-to-transnational-capitalism) hat this strike was a "collective bargaining by riot" seems to be an exaggeration. The Chinese workers are experiencing now what the Western workers have had to deal with in the 1920's and 30's, not to mention previous skirmishes during the Industrial Rev going back a couple of centuries.